The fatal crash site in Texas. Photo by Fox News. Hearts are heavy across Texas as one student is dead and another was severely injured, after a train hit their school bus as it was crossing the railroad tracks in Athens, Texas, about 70 miles southeast of Dallas. In response to Friday’s tragedy, the movement “Maroon on Monday” is being recognized by at least 43 different school districts and one college throughout Texas. The crash took place just after 4 p.m. on Friday. 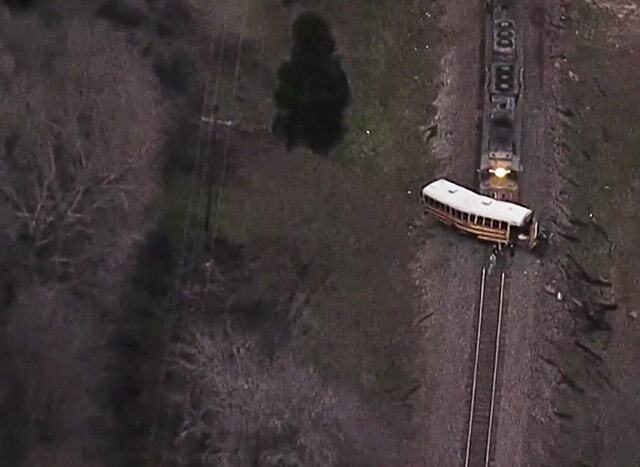 It involved a westbound Union Pacific train and a southbound Athens ISD school bus. An investigation is being conducted by the Athens Police Department. The bus was reportedly nearing its last two stops of the day. Christopher Bonilla, a 13-year-old seventh grader from Athens Middle School, was ejected from the bus during the crash. He was found near the railroad crossing, according to the Athens Police Department. The school bus driver, John Stevens, 78, was also ejected and was taken to the local hospital in Athens. He was later released. Blake Stiles, Athens ISD superintendent, said the bus driver has been employed by the school district for about a year.First responders also extricated fourth-grader Joselyne Torres, 9, of Central Athens Elementary, from the bus and was flown to Children’s Medical Center in Dallas with critical injuries. Reports indicated she was moved from the ICU and was in stable condition at this report. School Transportation News reached out to the Athens ISD Transportation Department to ask if the bus was equipped with lap-shoulder seat belts. School officials had not replied at the time of this writing. The fire chief for Athens Fire Rescue confirmed there was no crossing gate prior to the railroad crossing at this particular location where the school bus crossed. The police chief for Athens Police Department added there are no warning lights, arms or bells—only the “crossbuck” signs in place. After impact, the train pushed the bus for nearly a quarter of a mile before coming to a stop. The school district will also have counselors available at both affected schools, to help students through this tragedy. Christopher Bonilla’s funeral service will be held Friday at 11 a.m. at the Athens High School gymnasium. There will be no school, and all athletic events will be rescheduled on that day, Athens ISD said in a statement on Facebook. Nationally, this is the first fatal train-bus since 2015, when a bus driver and student were killed in Larimore, North Dakota. In that incident, the driver and student were ejected from the bus and 12 other students were injured. The railroad crossing had no crossing gate, and the bus skidded on gravel, when the freight train struck the bus at the right-front position. This is one of the five large school bus crashes to take place in Texas during the 2018-2019 school year. In September, dozens were injured after a bus carrying fifth-grade students crashed near the airport in Lampass, Texas. The bus reportedly hydroplaned and skidded off the road, crashing into a fence. There were a total of 27 people on the bus on their way to SeaWorld and 24 students were taken to the hospital as a precaution. In Mesquite, Texas, a school bus rolled into a ditch, hit a power line and erupted into flames. A middle school student, Jazmine Alfaro, died in the crash, and the driver and three other students were taken to the hospital. Another recent incident took place in Bastrop, Texas, at the end of October. An 18-wheeler hit a school bus that was attempting to make a right-hand turn. The children on board sustained minor injuries, 10 of whom were taken to the hospital to be treated. A school bus carrying five girl basketball players was hit head-on by an oncoming vehicle in December. The girls all sustained minor injuries and were transported to a hospital.